Fake Antivirus Programs, often called “Scareware,” are among the most common forms of malware you get from the Web. You are surfing the Web and all the sudden you get a pop-up window informing you that your computer is infected with all sorts of viral nasties. Where is this message coming from? 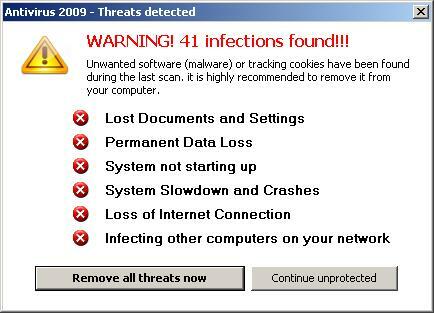 Well, it could be coming from your legitimate antivirus software (like Norton, McAfee, AVG). But most of the time you won’t recognize the product name from the pop-up window. 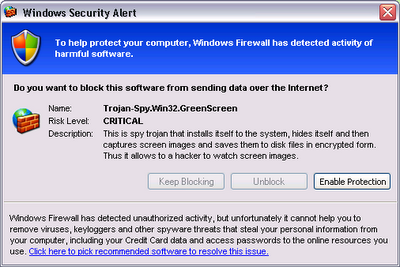 For example the message may be coming from a product called Internet Security 2010. “When did I ever install Internet Security 2010?” you might ask yourself. How did you get this Scareware? In most cases what happened was that you or someone using your computer visited an infected website, downloaded an infected program, or clicked on a dubious link. Now your computer is infected with a trojan horse (a particular kind of malware) posturing as a legitimate antivirus program. The irony is that this program, which is now telling you how many viruses and trojans it has detected on your PC, is itself the trojan horse! It’s like a burglar showing up at your front door posing as a property-crimes detective. Signs of infection with Scareware involve frequent pop-ups warning you that your computer is infected, the inability to close these pop-up windows, a slowdown in your computer performance–usually causing people to tear their hair out, gnash their teeth, and hurl curse words at their PC. The whole point of this scam is to get you to pay for their product (their bogus antivirus/anti-spyware solution) in the hopes that it will rid your PC of all this ghostly malware. Don’t do it. It can be costly to have a technician remove it for you, but you will generally get what you pay for. Pay the scammers and you’ll get nothing but a lighter wallet.